The good old great man theory tends to reduce the emergence of bebop to just a handful of musicians: Charlie Parker, Dizzy Gillespie, and Bud Powell. While there's no doubt that those players did more than anyone to spread the gospel of the music in the mid-40s, they were hardly alone. The latest title in Uptown Records' superb Flashback Series takes an invigorating look at the important role played—and the thrilling music made—by trumpeter Howard McGhee in Los Angeles during the same time. 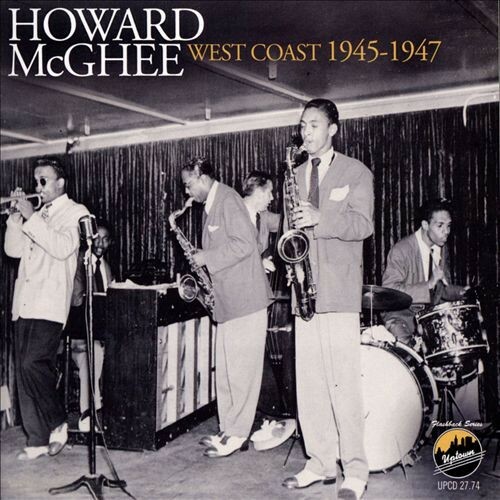 West Coast 1945-1947 contains eight previously issued studio sides, but the real hook is the presence of 11 radio performances from that period that evidence McGhee's protean power as an upper-register speed demon as well as a full-bodied lyricist on ballads. McGhee arrived in LA as part of a new combo led by tenor saxophonist Coleman Hawkins, but after a couple of months he discovered how much money his boss was raking in and raised a fuss. Hawkins replaced him. McGhee, a native of Oklahoma, chose to stick around, and soon put together a combo that included the superb alto saxophonist Teddy Edwards, who at the trumpeter's insistence switched primarily to tenor; eventually second tenor saxophonist J.D. King was added. The earliest material included here—four sides cut in September of 1945 for Philo Records, the burning Hawkins tune "Mop Mop" among them—establishes quickly that this group was playing bebop as well as anyone. Eight of the radio sessions are from December 21 of that year, made at a Hollywood club called Streets of Paris. Two tracks are by the Hollywood Four Blazes (a group obviously modeled after the early sound of the Nat King Cole Trio), who alternated sets with McGhee's sextet. As Kirk Silsbee's detailed liner notes point out, McGhee was not only an avant-gardist, but also had a pragmatic side to help make the new music more appealing to a green audience, whether that meant using set-piece gags or working with singers on more-conventional material—two of those six pieces from Streets of Paris feature pleasant but unremarkable vocals by the club's house singer, Monette Moore. Although he's not present on any of these recordings, Parker would briefly become a regular member of McGhee's band—in 1946 Bird cashed in a plane ticket for an engagement in New York with Gillespie, leading the way to his involvement with McGhee. The trumpeter was crucial in getting Parker through his seven months at the Camarillo State Hospital, where he was sent after he was arrested for setting his hotel room mattress on fire—he was deep in the throes of his heroin addiction. Parker was released in March of 1947 and spent a few months working in McGhee's band, but was back east by that summer. The final three live tracks on the new Uptown release were made shortly after Bird's departure, with an excellent band featuring Edwards, a 20-year-old Sonny Criss, pianist Hampton Hawes, bassist Addison Farmer, and drummer Roy Porter (who was a member of all of McGhee's LA bands). By 1948 McGhee had split LA, disgusted by its racism (he was married to a white woman and was frequently hassled and once even beaten by cops when he was out with her) and its musical conservatism. Below you can check out his ripping version of Gillespie's "A Night in Tunisia," one of the radio cuts from 1945. Howard McGhee, "A Night in Tunisia"